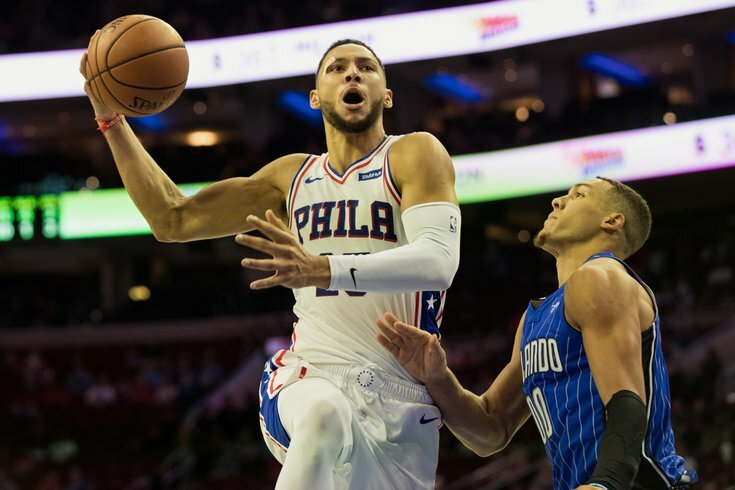 Philadelphia 76ers guard Ben Simmons drives past Orlando Magic forward Aaron Gordon during a preseason game at the Wells Fargo Center. The 2018-19 NBA regular season gets underway in just a few short days, with the Sixers getting their schedule started on Tuesday night on the road against the Celtics, a rematch of the playoff matchup that ended Philly's season. Last year, with a healthy Ben Simmons and Joel Embiid, the Sixers improved by an astounding 24 wins and not only made the postseason for the first time since 2012, but also won a series for just the second time in the last 15 years. Embiid, who took the league by storm in his first season of full health, was named to his first NBA All-Star Game while Ben Simmons won Rookie of the Year in his return from foot surgery a year earlier. It wasn't all smooth sailing for the Sixers, who managed to make that turnaround without the services of No. 1 overall pick Markelle Fultz. After a preseason shoulder injury, Fultz seemingly lost his shot, and although he returned for a brief stretch toward the end of the season, didn't appear to find it until he spent this past summer in Los Angeles training with Drew Hanlen. Shooting guard J.J. Redick will be back, as will Dario Saric, Robert Covington, T.J. McConnell and others, as well as a few new faces. So what does this year hold in store for Brett Brown's crew? We'll have a full preview coming out soon, but in the meantime, we figured it would be a good idea to show you what oddsmakers are expecting from the Sixers not only this season, but next summer also, as their name came up in relation to several pending free agents for the 2019 offseason. All the odds below were provided by MyBookie.ag — and you can check out all of their NBA odds here. Currently, only five teams have projected win totals over 50 — and the Sixers are one of them. If they hit this number, it would be a two-game improvement over the 2017-18 season. Here's a look at the Top 10 for this upcoming season. Aside from having the fifth-highest win total in the NBA, the Sixers also have the third highest in the NBA. Now that we know how many games the Sixers are predicted to win this season, it's time to take a look at what happens next: the playoffs. According to MyBookie.ag, the Sixers are a virtual lock to make the postseason at -3000, meaning you'd have to bet $3,000 just to make $100. If you want to bet on them to miss the postseason (+1500), a $100 bet would earn you $1,500. Those odds are the same as the Raptors and trail only the Celtics (-5000 to make the playoffs) in the Eastern Conference. Injured Sixers guard Zhaire Smith (+6600) is tied with local rookies Donte DiVincenzo (Bucks) and Lonnie Walker (Spurs) for the worst odds to win Rookie of the Year, according to MyBookie.ag. Meanwhile, the guy the Sixers actually drafted (before quickly trading him to the Suns), Mikal Bridges, is +4000 to win ROY. The favorites? Luka Doncic (Mavericks) at +250 and Deandre Ayton (Suns) at +300. Now, here's a look at the latest MVP odds, which features one Sixers player squarely in the Top 10 and another not that far behind. What team will Kyrie Irving sign with for the 2019 NBA season? What team will Klay Thompson sign with for the 2019 NBA season? What team will Al Horford sign with for the 2019 NBA season? What team will Demarcus Cousins sign with for the 2019 NBA season? What team will Anthony Davis sign with for the 2019 NBA season?